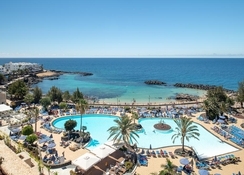 The Grand Teguise Playa Hotel is a lavish four-star property situated on Tenerife's beautiful beachfront and in the exclusive residential area of Costa Teguise, making it perfect for those who love relaxing on the beach. 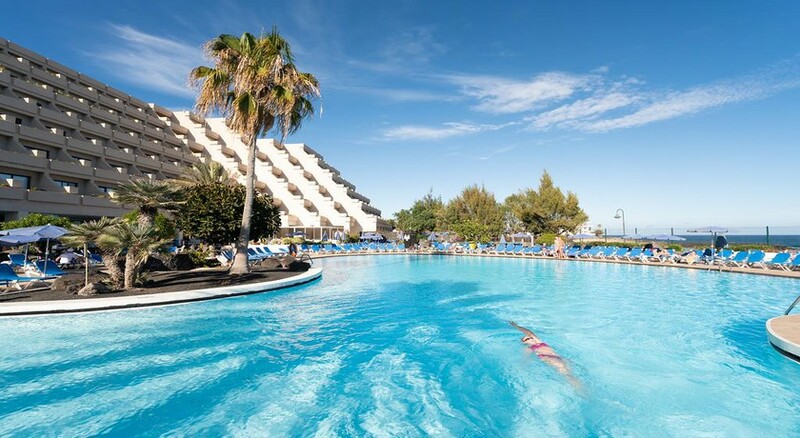 Located on El Jablillo Beach's coastline, this beach hotel is specially designed for couples and families with children who want to savour a Tenerife holiday in style. With 311 guestrooms, Grand Teguise Playa Hotel accommodates its guests with modern and contemporary amenities. All guestrooms offer mesmerising views of the ocean and often feature private balconies and terraces. Grand Teguise Playa Hotel boasts two adult swimming pools, as well as an in-house buffet restaurant that offers resplendent local and international cuisines. Located close to the city centre, there are numerous restaurants, bars and clubs that you can visit. 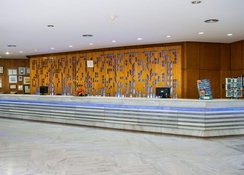 The Gran Teguise Playa Hotel is a Resort Hotel in Costa Teguise. Located on the El Jabillo Beach in Costa Teguise, Grand Teguise Playa Hotel is close to the city centre, offering various options to shop, eat and drink. The nearest airport of Lanzarote is about 15km from the hotel. The nearest beach of Playa del Jablillo is 100 metres while another beach of Las Cucharas is around 700 metres away. The hotel features 311 guestrooms tastefully decorated in bright, cheerful furnishings and soft colours. Based on view and accommodation capacity, the guestrooms are divided into double room with or without sea view, superior room with sea view, and suites. All rooms comprise all the basic amenities such as television, telephone, air conditioning, refrigerator, private bathroom with bathing facilities and in-room safe box. Some double rooms come with sea view, whereas superior rooms feature a furnished terrace with picturesque views of the ocean. All rooms are designed to provide comfort with large king, double or twin beds, floor to ceiling windows that open up on to beautiful landscape or ocean views. Playa Jablillo is the hotel's main buffet restaurant serving breakfast, lunch and dinner with local and international cuisines varying from salads, grilled meat along with special desserts. Additionally, live display cooking and theme dinners are available on three occasions a week at Playa Jabillo. A lobby bar serves chilled cocktails specially prepared by national cocktail champions. The poolside bar serves beverages along with delicious snacks all day long. - Christmas period: weekend before Christmas until the weekend after the day of Kings. - Easter: from the week before Easter until the week after it. 2. The playground will be removed. We had a fabulous time at this beautiful resort. They were so sweet to my daughter on her birthday. I can’t say enough great things about our stay. Excellence food brilliant.. good central position..staff helpful ..clean .. Entertainment excellent . Would definitely go back short drive to hotel from airport..clean... Staff very helpful ...entertainment team and shows top class ..food and variety of it .. Bar drinks good ..pool area clean drinks and snacks available in all good value for money . I go to this hotel at least once a year and I know many who visit at least 3 times a year. So friendly and welcoming and extremely clean. Stayed at the Teguise Playa a number of times and it never disappoints. Very happy with our stay here. We had one of the upper floor sea view rooms which had been modernised. Very comfy and clean. Food was plentiful in variety and well cooked every night. We were all inclusive so very happy what was on offer and the beer and wine were very good for AI. Pool was lovely, but could do with some maintenance, loose tiles around the edge and a couple of sharp edges, never a struggle for sun beds or parasols either. Great location for walks around the beaches, shops in the town, Eric’s Bar opposite to catch all the sport you want and a good car hire place opposite as well if you fancied driving over the island, which we did a few times. Would I return? Absolutely, and we are already planning to do so later this year. from and lots going on at this hotel. The reception area & bar were lovely. The pool & pool area were great, very clean & lots of sun beds. Pool bar was well stocked, unfortunately the rooms & hallways were in need of updating & decorating the bed was rock hard, I asked for plumper pillows but was told no.